One day before the finish, with just 300 miles to go, MAPFRE was in fifth place. As Tuesday morning dawned, and with the fleet ghosting towards the finish line in extremely light and shifty winds, Xabi Fernández’s team was among the leading quartet, battling in slow motion with Team Brunel, Dongfeng Race Team and Vestas 11th Hour Racing. And even when the leaders were just 500 metres from the finish line, MAPFRE was still trailing Team Brunel as the pair emerged from the fog within sight of the spectators at the Fort Adams Race Village. But on approach to the final turning mark, MAPFRE picked up a zephyr of wind to sneak past Brunel and claim what just moments earlier would have been seen as a very improbable leg win. The margin after nearly 16 days of racing was just 1-minute and 1-second. “This is unbelievable,” skipper Xabi Fernández admitted moments after crossing the finish line. “I can’t be happier. We were always hoping to come back a little bit but to be honest we were not expecting to win this leg, so we’re super happy. Bouwe Bekking’s Team Brunel, who had been leading for most of the past week after the equator crossing took a well-deserved second place finish. Dongfeng Race Team, who had been ahead of the fleet on the approach to the east coast overnight Monday night, suffered the cruellest fate over the final miles. Every break seemed to go against Charles Caudrelier’s team and after being in position to claim the leg win, the team had to settle for fourth place with Vestas 11th Hour Racing storming past Caudrelier’s crew in the final mile of the leg. Newport is a homecoming for Enright and Nick Dana on Vestas 11th Hour Racing as well as Mark Towill who did his college sailing nearby. The final hours were painful for the exhausted sailors but extraordinary to watch. With the wind nearly shutting down overnight on the approach to Newport, the fleet found itself pushed around by the tide and currents near shore, at times even drifting backwards, away from the finish line. This meant there was a high degree of uncertainty. Positions were never secure until the finish line was breached by MAPFRE. No one suffered more in the final miles than Dongfeng’s Caudrelier. The shocking win by MAPFRE has a huge impact on the overall race leaderboard where MAPFRE has regained the lead from Dongfeng, and now sits three points clear at the head of the table. Brunel retains the third podium position. Fifth across the line was team AkzoNobel, who passed Turn the Tide on Plastic just moments before the finish. A sixth place finish was disappointing for Dee Caffari’s Turn the Tide on Plastic, who led for several days early in the leg, and were in the fight with the leading group right up until the last hours, when they slipped back on the final approach. The light winds near the finish resulted in a massive compression in the fleet, all the way back to SHK/Scallywag who were trailing the leaders by over 130 miles just one day ago. 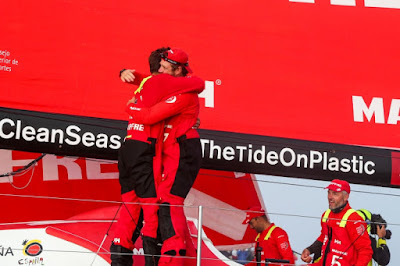 But as MAPFRE crossed the finish line on Tuesday morning, David Witt’s team was less than 20 miles behind and finished at 9:56am local time. The Race Village at Fort Adams in Newport, Rhode Island will officially open at 4pm on Tuesday afternoon.